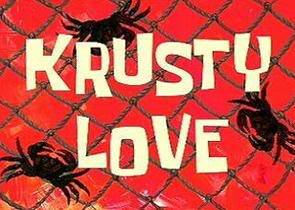 Krusty Love (Episode) – From SpongePedia, the biggest SpongeBob-wiki in the world! In this romantic episode it starts at the Krusty Krab, Mr. Krabs smells something weird. He goes to the cash register, where the smell is coming from. It's the smell of money. However, it doesn't smell like it usually does. Mr. Krabs can smell that the money is equal to $49.08, which means that 1 penny was lost. He goes crazy, while SpongeBob reassures him that 1 penny isn't much. Mr. Krabs, upon seeing Mrs. Puff, falls in love with her. He wonders what happened to Mr. Puff, and then the audience is shown his horrible fate (he was turned into a lamp). a dictionary, a stereo system, and almost a dryer to go along with the washing machine, in which some came in packages, wrapped in wrapping paper. Although, Mr. Krabs said not to spend any money! So, he becomes happy and angry at the same time. In the end, Mrs. Puff says she didn't need any of the gifts, then kisses Mr. Krabs which makes him blush then Mrs. Puff leaves him. When SpongeBob is cleaning the roof, you can see that there is nothing up there. The very next shot shows a closer view to SpongeBob and we can see that is a bucket there, which was not there before. This page was last modified on 25 August 2010, at 11:19.